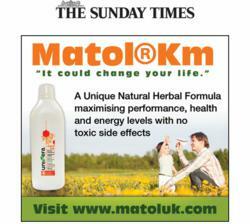 Health company Preventative Measures suggests a healthy New Years resolution by taking Matol Km. Many people have been taking this natural product for over 20 years; they claim Matol has amazing detoxifying effects. I have been taking Matol for over 15 years. With the help of Matol I am able to live a full and active life. – Annette Smith, 64, Stratford, UK. Everyone knows the importance of a healthy, well balanced diet. But it is not so well known that essential herbs and minerals are critical for digestive and overall health. They have been generally removed from modern conventional diets, but the unique Matol Km formula provides these natural phytonutrients in abundance. Km is also a great source of recommended daily minerals, in particular potassium and iodine. Km was invented in 1922 to maximise performance, welbeing and energy levels; with no toxic side effects.Matol Km is also a merger of modern science with time-tested traditional herbal remedies. Matol Km is essentially a herbal/potassium supplement. However, reports from customers say the formula can improve well being, eliminates toxins, balances the body’s acid-base levels, and supplements potassium and magnesium. Two very important minerals which are supplied in a colloidal form for easy absorption. The formula contains Chamomile (herb), Sarsaparilla (root), Dandelion (root), Horehound (herb), Licorice (root), Senega (root), Passion flower (herb), Thyme (herb), Gentian (root), Saw Palmetto (berry), Alfalfa (herb), Angelica (root), Celery (seed), Cascara sagrada (bark). In addition to the herbal complex, two tablespoons of Matol Km contains key minerals; 30.5 milligrams of calcium, 1.4 milligrams of iron, 22.5 milligrams of iodine and 350 milligrams or 10 percent of the recommended daily amount of potassium. During the three month recommended course of Matol® Km, customers report a better sense of well being, better looking skin and more energy. Customers take two tablespoons, twice a day before meals. Preventative Measures have found 30% of people feel a benefit during the first bottle. Another 30% during the second bottle; most people during the third bottle. They offer best savings are on the three-month course; i.e. three bottles. A fair trial would be 90 days. Matol is available in the original drink or in capsules called Kaps. Give it a try says UK Importer Chris Langley of Sanctuary Health & Nutrition Ltd. There is nothing to lose as the company gives Matol a 90 day money back guarantee. Matol was introduced into the UK in 1991. Also from Kee Technique in London and Healthcraft in Scotland.